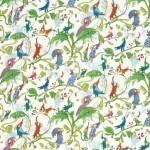 Unmistakably Quentin Blake, one of Britain's best loved illustrators most famous for Roald Dahl's books, these bright and breezy cockatoos perched on jungle leaves is a playful design from Osborne and Little. The largest bird measures 16cm/6.3inches and the smallest bird has a height of 9cm/3.5inches. The design is iconic and makes a fun, colourful backdrop for children's rooms. Bright multi-coloured birds perched on light green foliage set against a cream-toned background.Muted vibrant pastel birds perched on taupe foliage set against a cream-toned background.Vibrant pastel birds perched on blue foliage set again a pale blue tinted background.Deep multi-coloured birds perched on turquoise foliage set against an indigo background. The wallpaper calculator works out the precise quantity of Cockatoos for your dimensions taking into account the pattern repeat of 61 cm. Please note we allow 10% waste in case of any problems while hanging.